This is a list of all the flairs in the game. -Cake flair-Be a member for 1 year. -Speed Booster flair-Get a time lower than 2 minutes on Speed Attack. -Rocket flair-Get a time lower than 6 minutes on Space Station. -Wrench flair-Help report issues with the site or game (in a reasonable way). -Traplaunch flair-Finish Great Divide with a double traplaunch in less than 18.5 seconds (00:18.500). -Penguin flair-Donated at least $00.01 for Aayrl's Penguin Plunge. -Deadbeef flair-It was made for Dierking because of all his crazy assembly hacking. -Platinum Marble flair-Participated in a Marble Blast Platinum World Record Rampage. -Marble Blast Platinum's Logo flair-Only HiGuy has it. -Ultra Marble flair-Participated in a Marble Blast Ultra World Record Rampage. -Gold Marble flair-Participated in a Marble Blast Gold World Record Rampage. -Dragon flair-Only Matan (IsraeliRD) has it. -New Year flair-Logged in to the Marble Blast Website on either December 31st or January 1st to celebrate the new year. -Construction flair-Participated in the first Marble Blast 48-Hour Level Making Jam. -Olympic flair-Logged in to the Marble Blast Website during the 2016 Olympic Games. -Music flair-Created music or sounds for Marble Blast. -Yellow Trophy flair-Granted to Imperial for winning the 2014 1v1(v1) Marble Blast Multiplayer Tournament. 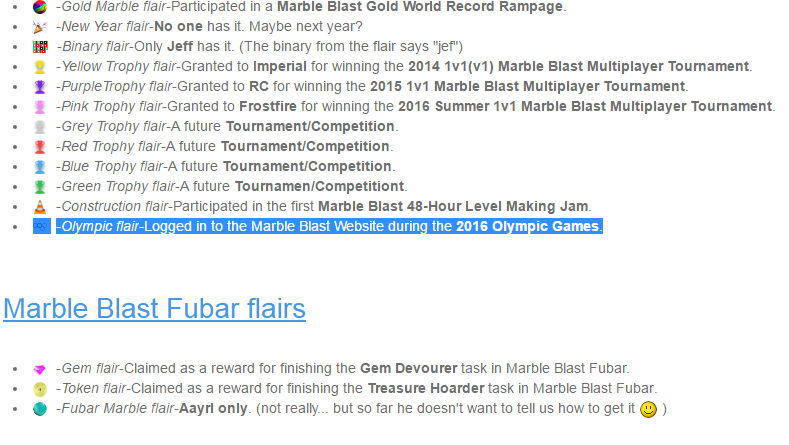 -PurpleTrophy flair-Granted to RC for winning the 2015 1v1 Marble Blast Multiplayer Tournament. -Pink Trophy flair-Granted to Frostfire for winning the 2016 Summer 1v1 Marble Blast Multiplayer Tournament. -Red Trophy flair-Granted to Kalle29 for winning the 2017 Winter Singleplayer Time Trial Tournament. -Blue Trophy flair-Granted to hPerks for winning the 2017 Summer 1v1 Marble Blast Multiplayer Tournament. -Winter Trophy flair-Granted to Frostfire for winning the Festival of Champions. -Green Trophy flair-Granted to Xedron for winning the 2018 Winter Singleplayer Time Trial Tournament. -Grey Trophy flair-A future Tournament/Competition. -PQ trophy 1 flair-A future Tournament/Competition. -PQ trophy 2 flair-A future Tournament/Competition. -PQ trophy 3 flair-A future Tournament/Competition. -PQ trophy 4 flair-A future Tournament/Competition. -PQ trophy 5 flair-A future Tournament/Competition. -PQ trophy 6 flair-A future Tournament/Competition. -PQ trophy 7 flair-A future Tournament/Competition. -PQ trophy 8 flair-Granted to IncanLlama for winning the 2018 Summer Multiplayer Tournament. -PQ trophy 9 flair-A future Tournament/Competition. -PQ trophy 10 flair-A future Tournament/Competition. -PQ trophy 11 flair-A future Tournament/Competition. -PQ trophy 12 flair-A future Tournament/Competition. -PQ trophy 13 flair-A future Tournament/Competition. -PQ trophy 14 flair-A future Tournament/Competition. -PQ trophy 15 flair-A future Tournament/Competition. -PQ trophy 16 flair-A future Tournament/Competition. -PQ trophy 17 flair-A future Tournament/Competition. -PQ trophy 18 flair-A future Tournament/Competition. -PQ trophy 19 flair-A future Tournament/Competition. -PQ trophy 20 flair-A future Tournament/Competition. -PQ trophy 21 flair-A future Tournament/Competition. -PQ trophy 22 flair-A future Tournament/Competition. -PQ trophy 23 flair-A future Tournament/Competition. -PQ trophy 24 flair-A future Tournament/Competition. -PQ trophy 25 flair-A future Tournament/Competition. -PQ Frightfest trophy flair-Granted to Kalle29 for winning the 2018 Frightfest Monster Mash Tournament. -PQ Winterfest trophy flair-Granted to IncanLlama for winning the Winterfest Festival of Champions 2018 Tournament. -PQ WHERe flair-Achieve the (PQ) status. -PQ flair-Staff only... for now. -Bronze PQ flair-Reward for the Quest Complete achievement: Finish every official (non-bonus) PQ level under Par Time. -Silver PQ flair-Reward for the Platinum Player achievement: Beat every official (non-bonus) PQ level's Platinum Time/Score. -Gold PQ flair-Reward for the Ultimate Player achievement: Beat every official (non-bonus) PQ level's Ultimate Time/Score. -Platinum PQ flair-Reward for the So awesome we couldn't think of a title achievement: Beat every official (non-bonus) PQ level's Awesome Time/Score. -Red Blue Yellow Gems flair-Reward for the Absolute Madness achievement: Collect every single gem in a non-bonus Gem Madness level. -Nest Egg flair-Reward for the Bird Watcher and Extra Chirpy achievements: Discover all the Nest Eggs in the official and bonus PQ levels. -Bubble flair-Reward for the Ultimate Breather! achievement: Get the Ultimate Time on Into the Deep without using any powerups at all. -Fireball flair-Reward for the Rapid Fire and Pants on Fire achievements: Destroy all the Ice Shards in Trial by Fire in under 4 minutes and finish Frozen Flames "the wrong way". -Anvil flair-Reward for the Unintended Workarounds achievement: Finish Terminal Velocity without using the Anvil powerup. -Gem flair-Claimed as a reward for finishing the Gem Devourer task (Collect 25 000 gems) in Marble Blast Fubar. -Token flair-Claimed as a reward for finishing the Treasure Hoarder task (Collect all tokens) in Marble Blast Fubar. -Beach Ball flair-Participated in the Fun in the Sun Event. -Rainbow Winter Hat flair- Find all the hidden Santas during the Winterfest Event. -2014 Snow Globe flair-Find all the hidden Snow Globes during the 2014 Winterfest Event. -2015 Snow Globe flair-Find all the hidden Snow Globes during the 2015 Winterfest Event. -2016 Snow Globe flair-Find all the hidden Snow Globes during the 2016 Winterfest Event. -2017 Snow Globe flair-Find all the hidden Snow Globes during the 2017 Winterfest Event. -Smiling Snowball flair-Win a Snowball-Only Teams match on Snow Brawl during the Winterfest Event where there are at least 2 teams. -Gingerbread Man flair-Find all 10 hidden Gingerbread Men during the Winterfest Event. -Candy Corn flair-Find all the hidden Candy Corn during the Frightfest Event. -Pumpkin flair-Earned all of the achievements on the Revised Halloween Levels during the Frightfest Event. -Pumpkin flair-Earned all of the achievements on the Original Halloween Levels during the Frightfest Event. -Ghost flair-Reward for the Ghost Whisperer achievement (winning 100 ghost hunt rounds). I think the yellow trophy was granted to Imperial for winning the "Xelna Race", the full MBP race that took place on 4 April 2015 without Xelna. Other than that, this looks terrific! I know that some members have been asking for how to get flair icons, and they will not be disappointed. Pretty good list, I think you got most of them right. The Yellow trophy was indeed awarded to Imperial for the 1v1(v1) tournament in 2014. There are two snowglobe flairs, and you'll notice they are slightly different. We changed the texture of the snowglobe for the 2015 winterfest event so it has a blue nameplate instead of a yellow one. Anyone who earned the achievement in 2014 was rewarded the flair icon with the yellow nameplate, and all future players who earn the achievement will earn the blue one. There's a couple more flairs that aren't listed because they're not in the game files yet, so I'll leave those as surprises for now .. I have a suspicion that the MBP logo flair is for participating in a MBP WRR? Double Diamond is actually 1:10 without time travels counting towards it. Checkpoints are fine. This was supposed to be the case but it ended up being only me who has it. Similarly with the platinum one, except it's only Matan. deadbeef - I made it for Dierking because of all his crazy assembly hacking. I don't think he ever wanted it; can't see why not :^). Just checked the DB, he doesn't even have it. Probably for the best, it looks like crap. Correct. Never got around to coding it, so you'll probably earn it for logging in on New Year's Eve / Day 2017. There is a method to my madness, but it's more fun to keep the flair lucrative. "PQ WHERe" flair should be an event flair. It was awarded to users who logged in during April Fool's Day 2016. Technically, his description is correct. The server will still give you the flair for getting (PQ) status, it's just that the April Fool's Day event gave you (PQ) status and by extension the flair. One other: we changed the requirements for the traplaunch flair to be sub-00:18.500 on the leaderboards; it's now awarded automatically. Last edit: 04 Dec 2016 18:31 by HiGuy. The Olympic flair is missing a spot on the list. In order to get the xbox flair, do you have to beat all platinum, gold, and ultra levels, or just one pack? And proof means physically recording this with a camera or what? Currently that flair is manually awarded. I added it for Threefolder when he beat MBP entirely using an xbox controller. If you have done the same and want the flair, just send me a message. PQ flairs don't currently have any unlock conditions... That will come later once the dust from the new levels settles.